This dress made me feel like a queen! 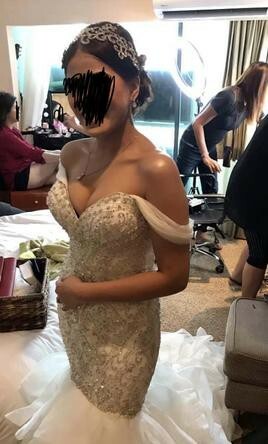 I would love to wear this again and again, unfortunately we only get married once right, so I might as well give it to another bride. You will surely fall in love with this as much as I did! This trumpet wedding dress features an organza ruffled skirt with horsehair trimmed detailing. The bodice dress features crystal beaded embroidery and a sweetheart neckline. The bodice has a built in corset as it emphasizes on your curves. The back of the dress has covered buttons down the zipper closure and a chapel length train. The dress is originally strapless but I added off shoulders straps that you can either tuck in or remove easily by cutting a small thread that attaches the straps to the dress if you’d prefer wearing strapless. But the off shoulder straps makes the dress a lot more dramatic. I also added three bustle straps inside the dress, so you can party all night long and won’t need to pay extra to add these. The original hip size of this is 37.5 inches, but I added an inch on each side that makes it 39.5 inches. You can easily alter this back tops original hip size if needed. The dress itself has a waistline of 25.5 in, but because of its corset nature it was able to easily accommodate my 27 in waist. I am 5’4 and wore 4 in heels, if you are taller it would still be able to accommodate you due to its ruffled style. There are no damages in this dress, but it has not been dry cleaned after my January 2019 wedding, so you will see minimal dirt at the bottom. Maybe less than half an inch from the bottom (only inside the dress, so you won’t even notice it outside as you wear the dress). Extra USD 150 if you’d like me to dry clean it before sending to you. Shipping will be an extra USD 60 if being shipped within USA. This sparkly headpiece that is in perfect condition I am also selling for USD 100, original 170 from David’s Bridal. - Bustle added. - Off shoulder straps added, can be easily removed. - Original hip size is 37.5, altered to 39.5 but can easily be altered to its original size if needed.